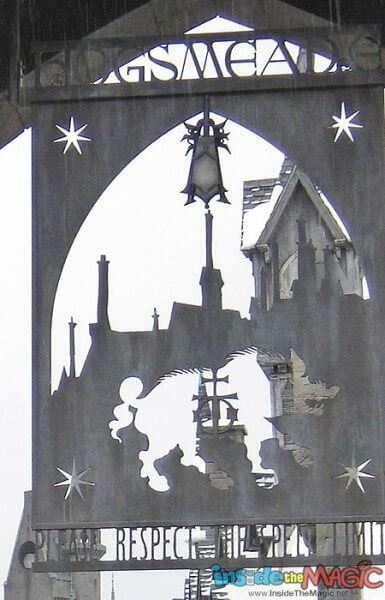 These new photos of Hogsmeade Village at the Wizarding World of Harry Potter should remove any doubts you might have of whether Universal Orlando has succeeded in recreating the detailed world from the Harry Potter films. You can click the photos below to enlarge them. 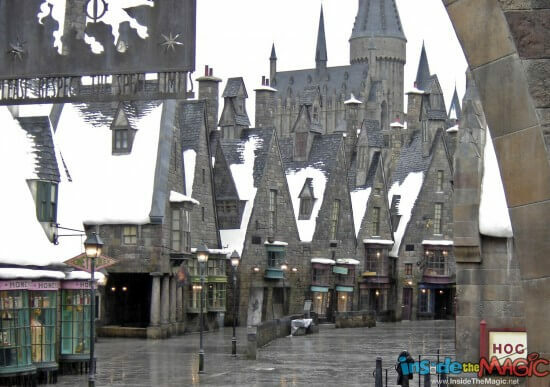 While trying to escape the rain by hiding close to a nearby tree, Inside the Magic reader Kristian Korner noticed he had an incredible view directly into the Wizarding World and snapped these pictures for us, showing how a little water on the ground can add even more authenticity to the “snow”-covered rooftops (it’s almost as if the snow has begun to melt and is running off into the streets). Since the rain clouds hid the normally-bright daytime Florida sun, the street lights within Hogsmeade Village have turned on, adding quite a bit of life to an otherwise empty (for now) area. Of particular note in these shots are Honeydukes and the Hog’s Head Pub on the left and, of course, Hogwarts Castle towering over the village in the background. In the above shot, on the right you see a covered seating area, presumably for guests wanting to eat outdoors at the Three Broomsticks restaurant. Toward the left of the frame in the distance is a peak of the Flight of the Hippogryph roller coaster ride. 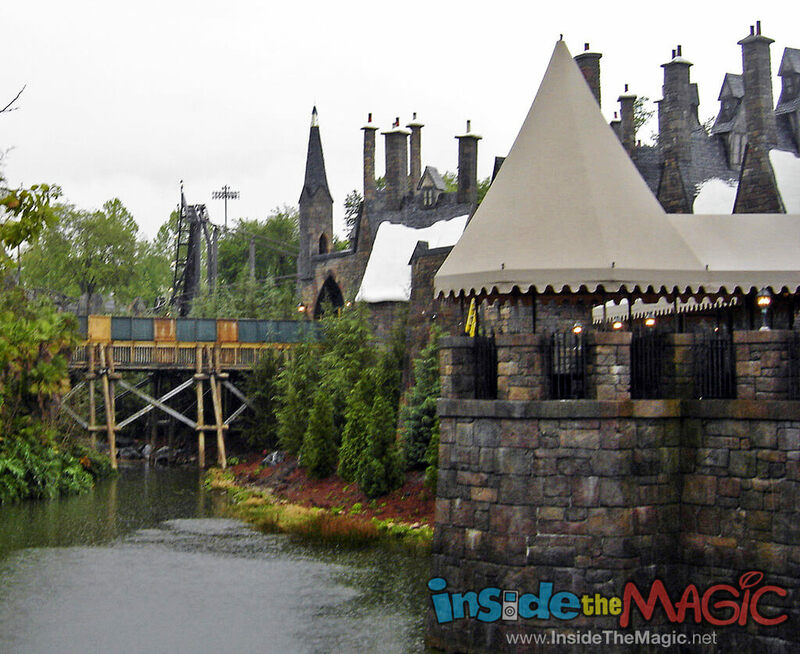 It’s clear from these photos that the Wizarding World of Harry Potter, at least on the outside, is nearly ready for guests to enter. Rumors currently point to soft openings of the new area near the end of May with its official grand opening being held on June 18. Thanks to Kristian for the photos! does it ever snow there? so that the pathways will be actually like hogsmeade? and is there a real village like hogsmeade or is it just a set? No, it doesn’t snow there… not even fake snow! It does feel like a real village, though it’s just one part of the overall Islands of Adventure theme park. 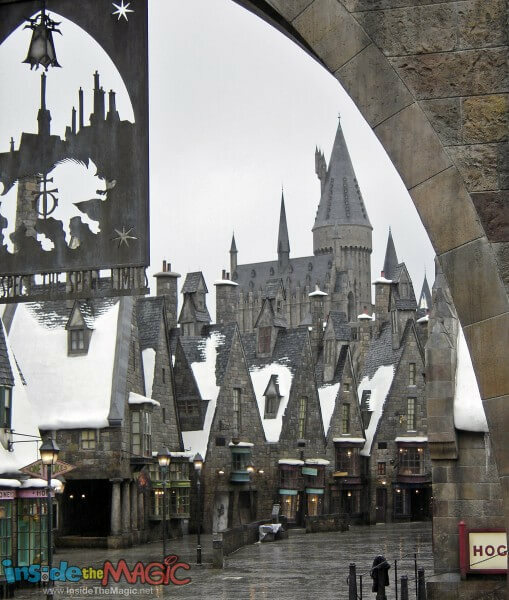 Ok, I’m over 60 and just got back home to Australia after a visit and all I can say is that I could have *lived* in Hogsmeade! It really felt like I was inside the story. The Butterbeer was great (a bit like a creaming soda but with a creamy head). I’m saving up to be able to go back. What a magical place it was!! The atmosphere in Hogsmeade Village is so fantastic, that you can really project yourself into the world of Harry Potter. I too am looking forward to my next visit. I’ve only got the length of the Eastern coast of the United States to travel to get there, so it won’t be so costly to get there. Good luck with saving for your next visit! First off I want to say awesome blog! I had a quick question in which I’d like to ask if you do not mind. I was curious to know how you center yourself and clear your thoughts prior to writing. I have had difficulty clearing my mind in getting my ideas out there. I truly do take pleasure in writing but it just seems like the first 10 to 15 minutes are generally lost just trying to figure out how to begin. Any recommendations or tips? Many thanks!